Singer-songwriter Charles Wright appeared on the scene as a funky, free-form frontman spouting catchphrases like 'Have mercy!' and 'In the jungle, babe!' 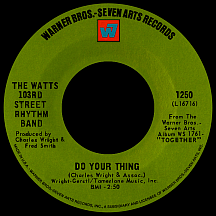 from "Do Your Thing," his winter-to-spring '69 hit with The Watts 103rd Street Rhythm Band. Wright had actually been performing for more than a decade leading up to that breakthrough, gaining experience on the streets of Los Angeles with several doo wop groups. It was a welcome change from his childhood as a sharecropper's son (one of 12 children) who'd endured long days working in the fields of Clarksdale, Mississippi. His family's move to L.A. came in 1952 when Charles was 12; at 18 he met singer-songwriter Jesse Belvin, which led to work as an unofficial member of "You Cheated" hitmakers The Shields (basically Frankie Ervin and a pool of rotating singers). Charles did studio sessions and live dates backing Ervin for the next couple of years, in addition to brief stints with The Twilighters ("Eternally" in 1959) and The Gallahads (a Seattle-based group that had a big Southern California hit in 1960 with "Lonely Guy" on L.A.'s Del-Fi label). Wright worked for Del-Fi owner Bob Keane and was involved in the haphazard production of one of the label's biggest hits, "Those Oldies But Goodies (Remind Me of You)" by Little Caesar and the Romans, in 1961. More session work followed and in 1966 he made his first solo single for Capitol as Charlie Wright, "Help Yourself," a standard soul number that failed to ignite. Further connections got him another one-shot on the Philips label; "(I'm Living On) Borrowed Time" seemed promising but likewise went nowhere. He put together The Wright Sounds, a band that numbered as many as nine at its peak; guitarist Al McKay, who'd toured with Ike and Tina Turner, was an early member. In late 1966, the Wright Sounds were hired by KGFJ radio personality Magnificent Montague (in addition to other L.A. studio players) to lay down some instrumental tracks to be used on his show; what resulted was "Grits 'n Corn Bread," credited to The Soul Runners on the MoSoul label, which received a lot of airplay on the station and even had a short run on the national pop and R&B charts (Mr. "Burn, baby, burn!" Montague had successfully pulled off this trick a year earlier with Hole in the Wall" by The Packers). Two more Soul Runners singles could have been recorded by any number of musicians including Wright's band, Bobby Womack and/or Leon Haywood, a Packers player. One track, "Spreadin' Honey" (the flip of "Grits"), turned up a few months later on a Keymen label 45 (with "Charley," another Soul Runners tune, on the B side), crediting another made-up musical crew, The Watts 103rd Street Rhythm Band. When the song hit the charts, Warner Bros. picked it up for distribution and the Wright Sounds were called upon to perform and promote the single under this new region-specific name. Once established at Warner, they were handed the plum assignment of backing Grammy-winning comedian and Emmy-winning I Spy actor Bill Cosby on his first attempt at singing, the album Silver Throat, which contained the surprise fall '67 top ten hit "Little Ole Man." During this time the band played regularly at the Haunted House, a nightclub on Hollywood Boulevard near Vine (in the '50s the trendy Zardi's Jazzland had occupied the same space); the stage was a giant monster's mouth and many up-and-coming rock, jazz and R&B acts performed there. During this time they became known for improvising lengthy instrumental jams, often with Wright's spoken comments (in lieu of actual singing). A pair of strictly-instrumental singles were issued on the Warner Bros.-Seven Arts label: "Brown Sugar" was another KGFJ fave (penned by Dr. John and Jessie Hill, a wilder version of the song had been released in 1966 as "Zu Zu Man" by The Zu Zu Blues Band), while "Bottomless" offered a bigger-band sound. Timing had placed them right in the thick of a trend towards a bolder mix of rhythm, blues and jazz; many would call it funk. The 1969 Watts 103rd lineup had Wright (piano, guitar and vocals) supported by eight experienced musicians. Raymond Jackson and Yusuf Rahman were trombonists, while Joe Banks and Gabriel Flemings played trumpet. Bassist Melvin Dunlap stood beside two tenor saxophonists, John Rayford and the act's only white participant, Bill Cannon. Drummer James Gadson had one additional skill that later proved quite useful. "Do Your Thing" came together when Wright began ad-libbing lines (some as simple as 'Do-do-do-dang-a-do-dang...'), accompanied by some mean McKay axe licks. Released by WB in November 1968, the hot, live 45 (taken from a Haunted House performance) developed slowly, hitting its stride in the spring of '69, reaching a number eleven peak the final week in April. Its follow-up, the similarly-structured, studio-made "Till You Get Enough," had a brief chart run that summer. Lest they fall into a rut, the formidable crew revealed a softer side on "Loveland" (a spring-summer 1970 hit) as Charles Wright and the Watts 103rd Street Rhythm Band, vocal duty on this one by percussionist James Gadson in place of bandleader Wright. 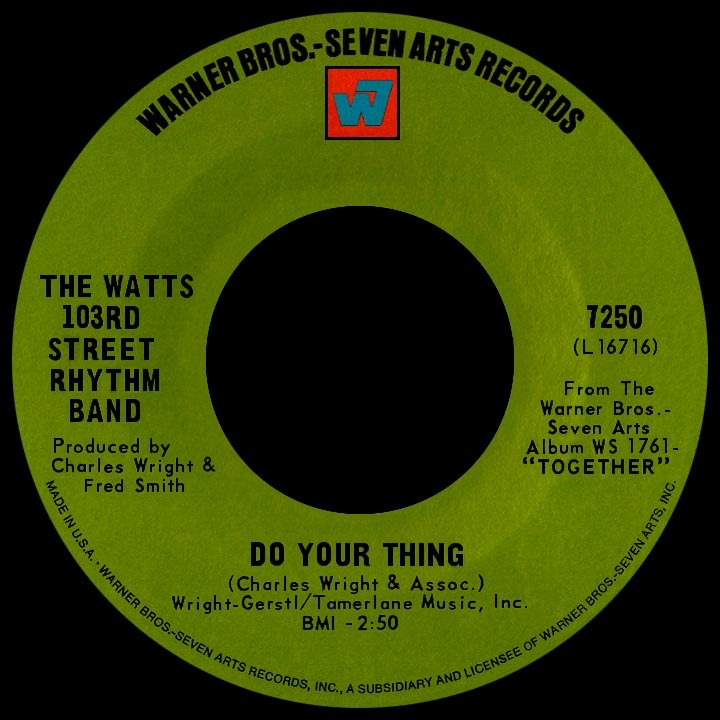 Despite the longer moniker, deejays and fans as well as some ads and concert posters shortened the name to its previous length or the even-shorter Watts Band or sometimes just Charles Wright, causing friction within the ranks (it wasn't just the name; there had already been personality clashes and artistic differences). McKay left and Bernard Blackman replaced him on guitar. Wright has claimed he tried to hold the band together, but a split was in the offing...at the height of their success. Further onstage improvising led to another hit, the one Wright has become most remembered for. "Express Yourself" offered encouragement to anyone amenable to Wright's free-form phrasing: 'It's not what you look like when you're doin' what you're doin'...it's what you're doin' when you're doin' what you look like you're doin'!' might get him laughed out of Tin Pan Alley, but this approach seemed fitting for the socially-charged activist era of the '70s. The single went top 20 in the fall and has since been sampled in hiphop songs, featured in movies and commercials, and used frequently on sports programs and at games, providing substantial royalty money for Charles (who wrote most of the 103rd Street Band's best-known material). Follow-up "Solution for Pollution" asked but didn't solve; a disorderly protest in comparison to more powerful statements by the likes of James Brown and Sly and the Family Stone, it barely charted. 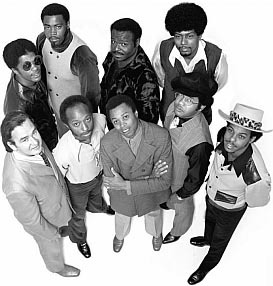 "Your Love (Means Everything to Me)" made canny use of Wright's gritty voice and placed the Rhythm Band in the R&B top ten in the spring of '71. By 1973, Al McKay was on the rise with Earth, Wind and Fire while a few other members had embarked on solo careers. Wright signed with Dunhill Records and had one solo chart single, "(Well I'm) Doin' What Cums Naturally." In the 1990s, Charles Wright started his own label, A Million Dollars Worth of Memories Records, continuing to release albums and enjoy his musical relevance into the next century.